Create your own decoration to give your floral arrangements and crafts a unique, personal touch. The combination of Colorco Lettering and Novelty Illustrations truly allows for that individual look. Our adhesives are acid and lignin free. Silver and Opal is print treatable with permanent ink markers for a variety of artistic creations. 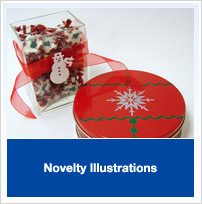 See our Script Holidays & Special Occasions for fun holiday products.